To compare the refractive outcomes and aberration data analysis of wavefront-optimized (WFO) ablation and topography-guided Contoura ablation (TGCA) (Contoura on the WaveLight laser; WaveLight GmbH, Erlangen, Germany) in patients who had laser-assisted in situ keratomileusis (LASIK) for myopia or myopic astigmatism. In this comparative contralateral eye study, patients who underwent LASIK with TGCA in one eye and with WFO ablation in the fellow eye were analyzed. Aberration measurements and corneal topography were analyzed using the WaveLight Oculyzer II diagnostic device (Alcon Laboratories, Inc., Fort Worth, TX). Total corneal higher order aberrations (HOAs) including vertical and oblique astigmatism (Z22, Z2−2), coma (Z31, Z3−1), trefoil (Z33, Z3−3), spherical aberration, and Q value were analyzed. These measurements were taken preoperatively and 3 months postoperatively. This study comprised 32 patients. There were no significant differences between both procedures according to postoperative uncorrected and corrected distance visual acuity values, refractive errors, and manifest refraction spherical equivalents within ±0.50 diopters (D) of emmetropia (P > .05). The preoperative corneal HOAs and Q values were also similar between the groups (P > .05). At 3 months postoperatively, the vertical and horizontal coma values in the WFO ablation group were statistically significantly higher compared to the TGCA group (P = .013 and .020, respectively). Less stromal tissue was ablated in the TGCA group compared to the WFO ablation group (P < .001). Although WFO ablation and TGCA protocols had statistically similar visual outcomes, the TGCA protocol was associated with a significantly lower induction in vertical and horizontal coma and smaller amount of tissue ablation compared to WFO ablation. Clinical refractive astigmatism and topography-measured anterior corneal astigmatism are rarely identical in magnitude and axis, and this difference is termed ocular residual astigmatism.14 This difference is a topic that requires further research and has implications regarding what refraction to treat with TGA to maximize outcomes.14 Hence, a new TGA protocol (Contoura on the WaveLight laser; WaveLight GmbH, Erlangen, Germany) has been developed using the topography-measured refraction (Contoura with Layer Yolked Reduction of Astigmatism [LYRA]) treatment profile that determines the relationship between HOAs and lower order corneal astigmatism and obtains a more aspherical cornea (uniformly shaped cornea). Motwani12 showed that HOAs interacting with lower order astigmatism is the main reason for the differences between manifest refraction and Contoura-measured astigmatism, and the link between these interactions can be successfully treated using Contoura and the LYRA protocol. The Contoura-measured astigmatism correction is derived by a systematic analysis of the cornea with a WaveLight proprietary algorithm and may be markedly different from the manifest refraction, resulting in a dilemma for refractive surgeons. The manifest refraction (cycloplegic or non-cycloplegic) and the autorefraction often do not correspond with the astigmatism that the Contoura is processing results in. In other words, the magnitude and axis of astigmatism used in the Contoura with LYRA protocol is the magnitude and axis of the astigmatism that needs to be corrected after the treatment of corneal HOAs. To our knowledge, there are no studies comparing the refractive outcomes and aberration data analysis of WFO ablation and topography-guided Contoura ablation (TGCA). This study aimed to compare the refractive outcomes and aberration data analysis of WFO ablation and TGCA with LYRA protocol using the Allegretto Wave excimer laser platform (WaveLight EX500; Alcon Laboratories, Inc., Fort Worth, TX) in the treatment of virgin eyes with myopia or myopic astigmatism. This comparative, contralateral eye study was performed by the refractive surgery department in an eye hospital. The study protocol conformed to the tenets of the Declaration of Helsinki and was approved by the hospital's ethics committee. Written informed consent was obtained from all participants before the procedures. All patients in the study were between 18 and 35 years old with a stable refraction (a change of ±0.50 diopters [D] or less) for at least 1 year prior to surgery. Additionally, the inclusion criteria according to the patients' refractive errors were spherical myopia of 0.50 to 8.00 D, astigmatism between 0.00 and 3.00 D, and maximum manifest spherical equivalent of 9.00 D. Exclusion criteria for the study were anterior segment abnormalities including corneal haze, corneal scar, or cataracts; abnormal corneal topographies such as keratoconus or keratoconus suspect; a history of previous corneal or ocular surgery; significant dry eye; corneal basement membrane disease; a central corneal thickness of less than 480 µm; an estimated postoperative residual stromal bed thickness of less than 300 µm; macular and/or retina pathologies; glaucoma; anisometropia; pregnancy or lactation; and systemic abnormalities such as diabetes mellitus, collagen vascular diseases, or autoimmune diseases. Patients wearing rigid contact lenses were instructed to stop wearing them at least 4 weeks prior and patients wearing soft contact lenses were instructed to stop wearing them at least 2 weeks prior to the surgery. All LASIK surgeries were performed by the same experienced surgeon (KO) at the same center using the WaveLight EX500 laser (Alcon Laboratories, Inc.), WaveLight FS200 Femtosecond Laser (Alcon Laboratories, Inc.), and the WaveLight Allegro Topolyzer (Alcon Laboratories, Inc.) under aseptic precautions and topical anesthesia after instilling 0.5% proparacaine hydrochloride. The laser platform was used to perform a flap thickness of 120 µm and a flap diameter of 9 mm with a 70° angled side cut. The optical diameter was 6.5 to 7 mm for both eyes. Spot and line separations were 8 and 8 µm for the bed cut and 5 and 3 µm for the side cut, respectively. After drying the stromal bed, excimer laser ablation was performed. The bed was thoroughly irrigated with saline and the flap was repositioned on the stromal bed. Aberration measurements and corneal topography were analyzed using the WaveLight Oculyzer II diagnostic device (Alcon Laboratories, Inc.). Total corneal HOAs including coma (Z31, Z3−1), trefoil (Z33, Z3−3), spherical aberration, and Q value (corneal asphericity) in the Zernike analysis were recorded. Vertical and oblique astigmatism (Z22, Z2−2) values were also analyzed. Total corneal aberrations, calculated from the elevation values by the Pentacam software (Oculus Optikgeräte, Wetzlar, Germany), were evaluated in the 6-mm diameter central area with respect to the pupil center in the dark environment, and the pupil was not dilated. Only patients who underwent LASIK by TGCA with LYRA protocol in one eye and WFO ablation in the fellow eye for the correction of myopia or myopic astigmatism were analyzed for the study. TGCA with LYRA protocol could be used if: (1) astigmatism was 2.00 D or greater, the difference of astigmatic axis less than 5° between manifest and Contoura measurements; (2) astigmatism was 1.75 D or less, the difference of astigmatic axis less than 10° between manifest and Contoura measurements; and (3) the astigmatic difference was 0.75 D or less between manifest and Contoura measurements. All surgical planning was done using the Wavenet Server and Contoura planning system using the LYRA protocol. For the TGCA with LYRA protocol, high quality topographic images were taken with the Topolyzer Vario (Allegro, WaveLight; Alcon Laboratories, Inc.). Of the 8 to 12 scans performed per eye, at least four similar scans with appropriate iris registration were required to proceed to the surgical planning page. The astigmatism and axis were taken from the surgical planning page in the Contoura planning software. The planning page was available after processing the Topolyzer images and entering the patient's manifest refraction, pachymetry, and pupil size measurements. On the surgical planning page, surgeons can enter the final sphere, astigmatism, and axis. The changing of the ablation pattern can also be seen with the change of values on this page. Manifest refraction is entered into the Contoura during presurgical planning. The sphere and astigmatism are reset to see the ablation pattern only for the HOA removal (or aberration correction layer). Astigmatism and the axis obtained from Contoura measurements are entered. (The Contoura-measured astigmatism correction is derived by systemic analysis of the cornea with a WaveLight proprietary algorithm and might be different from manifest refraction.) The ablation profile and Pentacam elevation map should closely match. The sphere is entered after adjustment for the spherical equivalent of the change in astigmatism. All participants underwent a comprehensive ophthalmic examination including uncorrected (UDVA) and corrected (CDVA) distance visual acuity testing, manifest refraction, cycloplegic refraction, intraocular pressure measurements with a pneumotonometer, slit-lamp biomicroscopy, and dilated fundus examination. Total corneal HOAs including vertical and oblique astigmatism (Z22, Z2−2), coma (Z31, Z3−1), trefoil (Z33, Z3−3), spherical aberration, and Q value in the Zernike analysis were analyzed. These measurements were taken preoperatively and 3 months postoperatively. An a priori power analysis using the PASS calculation software (Power and Sample Size, version 11; NCSS, LLC, Kaysville, UT) indicated at least 30 patients were necessary to reach a power equal to at least 80% in the study. We enrolled 32 patients with myopia or myopic astigmatism in this study. Accordingly, the power of our study was 81.5%. The study data were analyzed by SPSS software (version 22.0 for Windows; SPSS, Inc., Chicago, IL). Descriptive data were presented as the mean ± standard deviations, frequency distributions, and percentages. Pearson's chi-square test and the one-sample chi-square test were used to analyze the categorical variables. The normal distribution of the variables was tested by visual (histogram and probability graphs) and analytical (Kolmogorov–Smirnov/Shapiro–Wilk test) methods. For intergroup (TGCA vs WFO ablation) and intragroup (preoperative vs postoperative data) comparisons, the paired samples t tests were used for normally distributed variables and Wilcoxon signed-rank tests were used for those that were not normally distributed. The statistical significance was set at a P value of less than .05. Sixty-four eyes of 32 patients were analyzed in the study. There were 13 women (40.6%) and 19 men (59.4%) with a mean age of 27.5 ± 4.9 years (range: 19 to 41 years). 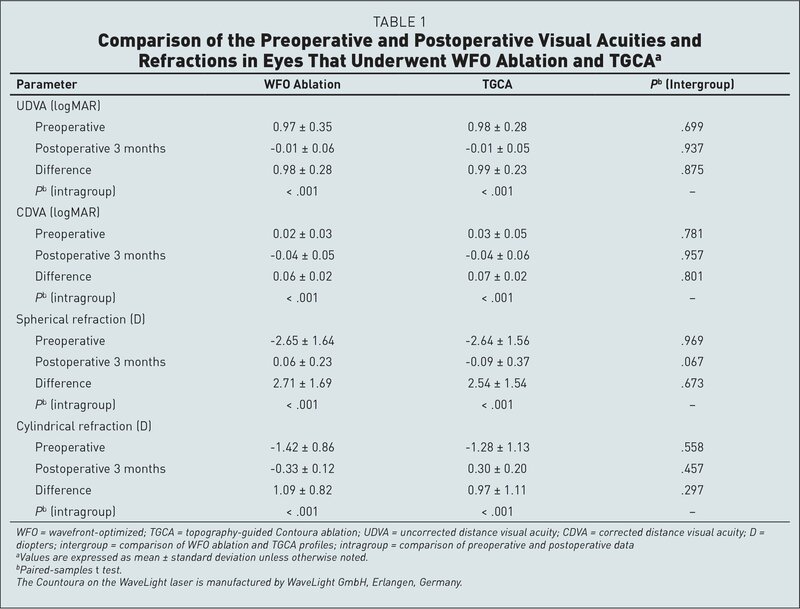 Table 1 shows the preoperative and postoperative visual acuity values and refraction data of the eyes that underwent WFO ablation and TGCA. In the WFO ablation group, 92% of the eyes achieved a UDVA of 20/20 or better at 3 months postoperatively (Figure 1). This ratio was 96% in the TGCA group (Figure 1). No patient lost lines of visual acuity. There were no significant differences between the two procedures in terms of postoperative visual acuity values (UDVA and CDVA) and refractive errors (spherical and cylindrical) (P > .05). 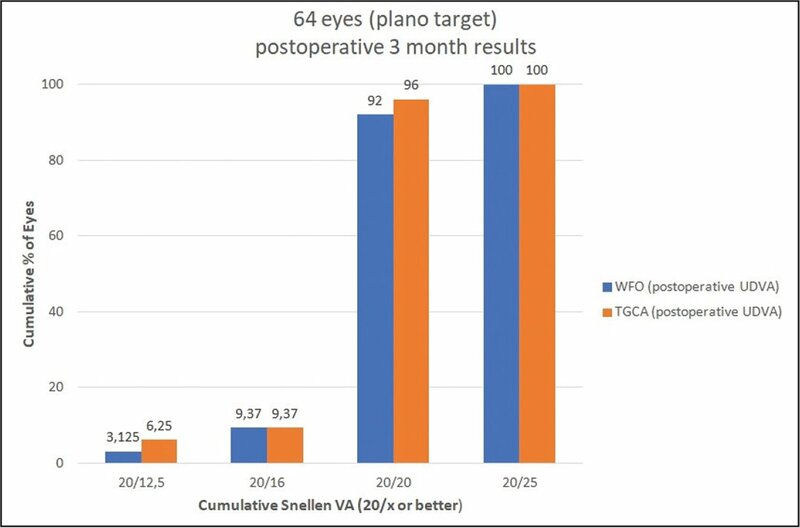 When the surgical predictability was defined as the percentage of eyes corrected to ±0.50 D of the intended correction, 94% of the eyes in the WFO ablation group and 97% of the eyes in the TGCA group met this criterion (Figure 2). The mean manifest refraction spherical equivalent 3 months postoperatively was −0.21 ± 0.40 D (range: −1.00 to +0.50 D) in the WFO ablation group and 0.05 ± 0.23 D (range: −0.57 to 0.48 D) in the TGCA group. Both procedures had similar predictability for manifest refraction spherical equivalent within ±0.50 D of emmetropia (P = .201). The preoperative and postoperative astigmatism values of the groups are shown in Figure 3. In the WFO ablation group, 65.7% of the patients achieved a postoperative astigmatism of less than 0.50 D, whereas this ratio was 68.8% in the TGCA group. Table 2 demonstrates the preoperative and postoperative corneal aberration and asphericity data of eyes that underwent WFO ablation and TGCA. All preoperative corneal HOAs and Q values were similar between the groups (P > .05). 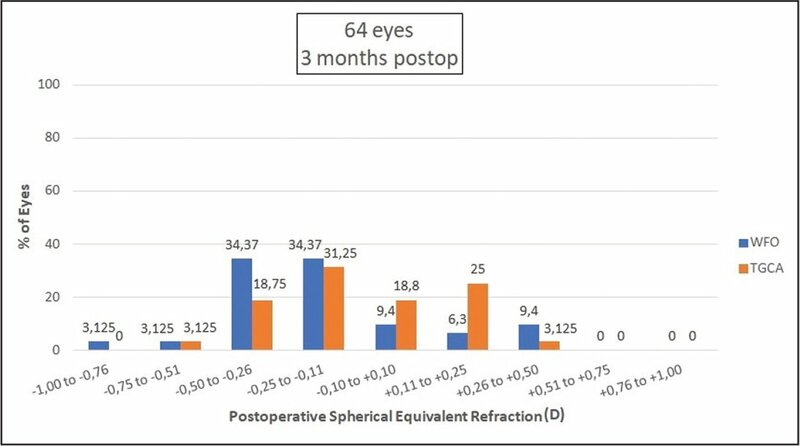 Three months postoperatively, the vertical and oblique astigmatism values of eyes in both groups were statistically significantly reduced (P < .05). At 3 months postoperatively, the vertical and horizontal coma values of the eyes that underwent WFO ablation were statistically significantly higher compared to eyes that underwent TGCA (P = .013 and .020, respectively). The ablation depth was 75.7 ± 13.5 µm in the WFO ablation group and 60.5 ± 13.5 µm in the TGCA group. Statistically significantly less stromal tissue was ablated in the eyes that underwent TGCA compared to WFO ablation (P < .001). Motwani20 retrospectively reviewed the WaveLight Contoura data of the patients who underwent WFO ablation with their manifest axis of astigmatism and reported that the eyes that had an incorrect manifest axis resulted in a new, abnormal induced astigmatism on a wholly new axis. He revealed that the astigmatism and axis values of these patients obtained from the Contoura differed from their manifest values before the WFO ablation, and thus a new abnormal induced astigmatism on a wholly new axis appeared. In another study,21 Motwani analyzed the outcomes of eyes that underwent TGCA with LYRA protocol and reported that the average difference of astigmatic power from manifest to measured is 0.50 D and the average difference of axis is approximately 15°. Additionally, 80% of eyes with plano as the goal had a visual acuity of 20/10 or better and 100% had a visual acuity of 20/20 or better.21 Moreover, polynomial analysis of the same study exhibited that the average C3 reduced by 86.5% and the average C5 reduced by 85% postoperatively.21 Our results also demonstrated that 96% of eyes that underwent TGCA with LYRA protocol achieved a UDVA of 20/20 or better 3 months postoperatively. Moshirfar et al.22 assessed and compared the differences in visual outcomes between the WFG VISX iDesign (Johnson & Johnson Vision, Jacksonville, FL), topography-guided WaveLight Allegro Contoura, and topography-guided Nidek EC-500 CATz (Nidek Inc., Gamagori, Japan). They showed that although all three systems show excellent results with respect to efficacy, safety, accuracy, and stability, the WaveLight Allegro Contoura had a statistically significant better outcome of eyes achieving within 0.50 D of emmetropia.22 Additionally, this study revealed that, when analyzing greater than second order root mean square of HOAs, the magnitude is smaller for the Alcon Contoura than the VISX iDesign or Nidek CATz.22 Our study also demonstrated that the induction in vertical and horizontal coma values is significantly lower after TGCA with LYRA protocol compared to WFO ablation. The current study also revealed that statistically significantly less stromal tissue was ablated in the eyes that underwent TGCA compared to WFO ablation. Jain et al.18 also showed that topography-guided LASIK is associated with a smaller amount of stromal tissue ablation compared to WFO ablation. This finding, if reproducible in other clinical investigations, might have significant clinical implications because saving corneal tissue may help expand the pool of candidates eligible for refractive surgery or the amount of refractive error that can be safely corrected. Another controversial issue is the uncertainty as to whether TGCA with LYRA protocol can treat the whole eye because the measurements used during this treatment are obtained by a Topolyzer. According to Motwani's hypothesis,12 the incidence of residual astigmatism posterior to the cornea is much less than expected, and the largest and the most important part of the correction is the anterior corneal surface. This study had limitations. First, the sample size is relatively small. Second, corneal aberrations were assessed using a Pentacam device, not an aberrometer. The analyses of the repeatability of the Pentacam for the measurement of aberrations have yielded conflicting data.23,24 Finally, we did not evaluate contrast sensitivity under photopic and mesopic conditions. However, to the best of our knowledge, this is the first study comparing the refractive outcomes and aberration data analysis of WFO ablation and TGCA with LYRA protocol. The current study found statistically similar refractive outcomes with WFO ablation and TGCA with LYRA protocol in virgin eyes with myopia or myopic astigmatism; however, TGCA with LYRA protocol is associated with significantly lower induction in vertical and horizontal coma and a smaller amount of tissue ablation compared to WFO ablation. Therefore, we prefer to perform TGCA with LYRA protocol for normal eyes with these types of refractive errors and suggest a promising role for the more widespread use of TGCA with LYRA protocol in virgin eyes with myopia or myopic astigmatism. However, larger studies that measure the contrast sensitivity with longer follow-up periods are needed to further evaluate the results of TGCA with LYRA protocol in this range and higher amounts of refractive errors. From TOBB ETU Hospital, Department of Ophthalmology, Ankara, Turkey (KO, SA); Kastamonu University, Ophthalmology Department, Kastamonu, Turkey (EY); Ercis State Hospital, Ophthalmology Department, Van, Turkey (KT); and Ulucanlar Eye Training and Research Hospital, Ophthalmology Department, Ankara, Turkey (HK).